German scholar of the eighteenth century. Under the title "Be'er ha-Torah" he translated into German the Pentateuch, the Hafṭarot, and the Five Scrolls, and published the work in Amsterdam in 1758. 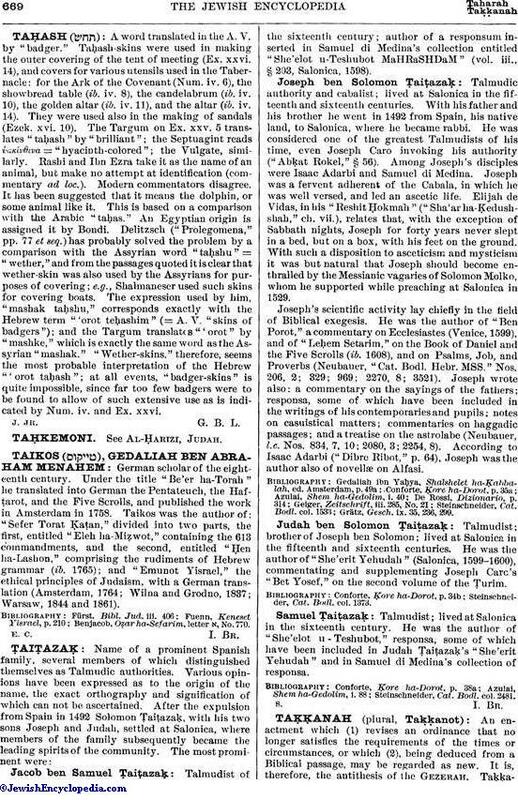 Taikos was the author of: "Sefer Torat Ḳaṭan," divided into two parts, the first, entitled "Eleh ha-Miẓwot," containing the 613 commandments, and the second, entitled "Ḥen ha-Lashon," comprising the rudiments of Hebrew grammar (ib. 1765); and "Emunot Yisrael," the ethical principles of Judaism, with a German translation (Amsterdam, 1764; Wilna and Grodno, 1837; Warsaw, 1844 and 1861). Benjacob, Oẓar ha-Sefarim, letter א, No. 770.